Chroma is a 2017 Advancing Healthcare Award recipient and the UK’s leading national provider of arts therapies services. We provide neurologic music therapy, dramatherapy and art psychotherapy. 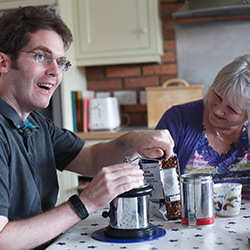 We help people of all ages and at all stages of neurological rehabilitation as a result of an ABI/TBI, stroke, dementia including the emotional and social problems associated with a brain injury. We work nationally with case managers, solicitors,OTs, schools, hospitals, local councils, often acting as a leader in pioneering new techniques and new thinking. Our services are always provided locally near to where clients live. Chroma has a fully staffed clinical services infrastructure that supports the work our therapists undertake. ‘We have worked with Chroma for the last four years to provide Neurologic Music Therapy as part of our rehabilitation program. Their work supports children with acquired brain injury, complex disability and children requiring post-surgical rehabilitation. Chroma work closely with us to understand our needs and define and develop our neurologic music therapy provision to meet these. We are delighted with our Neurologic Music Therapist who has fully integrated into our service and is very much a part of our team.’ The Portland Hospital for Women and Children, 2017.